• contemporary topics such as homelessness, ethnic health and electronic records. Concise summaries, highlighted boxes, extensive referencing and a dedicated section on effective learning make this essential reading for postgraduate students, tutors and researchers in primary care. “Trish Greenhalgh, in her frequent columns in the British Medical Journal…more than any other medical journalist spoke to her fellow GPs in the language of experience, but never without linking this to our expanding knowledge from the whole of human science. "Trish Greenhalgh is one of the international stars of general practice and a very clever thinker. This new book is a wonderful resource for primary health care and general practice. Every general practice registrar should read this book and so should every general practice teacher and primary care researcher." Trisha Greenhalgh Department of Primary Care and Population Sciences, University College London, UK. Author of bestselling How to Read a Paper and Diffusion of Innovations in Health Service Organisations (Blackwell Publishing BMJ Books). 1.1 What is primary (health) care?. 1.2 What is academic study?. 1.3 What are theories – and why do we need them?. 2 The ‘ologies’ (underpinning academic disciplines) of. 3 Research methods for primary health care. 3.1 What is good research in primary health care?. 3.6 Research data – and analysing it. 3.7 Critical appraisal of published research papers. 3.9 Multi-level approaches to primary care problems. 4 The person who is ill.
4.3 Lifestyle choices and ‘changing behaviour’. 5 The primary care clinician. 5.1 The role of the generalist. 5.2 Clinical method I: rationalism and Bayes’ theorem. 5.3 Clinical method II: humanism and intuition. 5.4 Clinical method III: the patient-centred method. 6.1 The clinical interaction I: a psychological perspective. 6.2 The clinical interaction II: a sociolinguistic perspective. 6.3 The clinical interaction III: a psychodynamic perspective. 6.4 The clinical interaction IV: a literary perspective. 7 The family – or lack of one. 7.1 Family structure in the late modern world. 7.2 The mother–child relationship (or will any significant other. 7.3 Illness in the family – nature, nurture and culture. 8.1 Describing disease in populations. 8.2 Explaining the ‘causes’ of disease. 8.3 Detecting disease in populations. 8.4 ‘Risk’: an epidemiological can of worms?. 9.1 Unpacking health inequalities I: deprivation. 9.2 Unpacking health inequalities II: social networks and social. 9.3 Unpacking health inequalities III: life course epidemiology. 9.4 Developing healthy communities I: community oriented. 9.5 Developing healthy communities II: participatory. 10 Complex problems in a complex system. 10.1 Illness in the twenty-first century: chronicity, comorbidity. and the need for coordination. 10.2 Coordinating care across professional and organisational. 10.3 The electronic patient record: a road map for seamless. 10.4 The end of an era?. 11.1 Defining and measuring quality. 11.2 A rational biomedical perspective: evidence-based targets,. planned change and criterion-based audit. 11.3 A narrative perspective: significant event audit. 11.4 A social learning perspective: peer review groups and. 11.5 A phenomenological perspective: the patient as mystery. 11.6 A sociological perspective: Quality Team Development as. 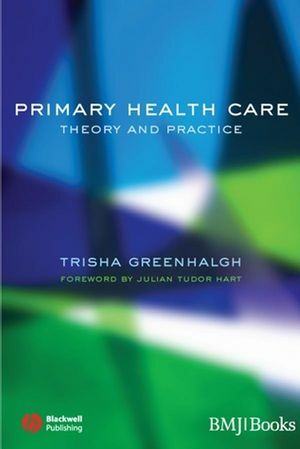 "Trish Greenhalgh is one of the international stars of general practice and a very clever thinker. This new book is a wonderful new resource for primary health care and general practice. Every general practice registrar should read this book and so should every general practice teacher and every primary care researcher." "General practice in the U.K. is responsible for more patient care than ever before, and its input to medical training and research is at an all-time high. But its broadening roles and changing political context are at risk of causing an identity crisis. We are fortunate that Professor Trish Greenhalgh has brought her passion, intelligence and scholarship to bear on one of the key questions for health professionals today - what is the best of primary care about, and why is it essential for patients and doctors? She encourages debate while supporting and inspiring primary care, because she tells a modern story of a discipline whose purpose is valuable and which can rise to its new challenges. I am personally very glad to have read this timely and exciting book." "This book meets a real need for a lively, engaging and perceptive book that brings together the population with the individual perspective and describes the key concepts that underpin contemporary primary care with admirable clarity. This book deserves to become a classic and will be welcomed by enquiring undergraduates and postgraduates alike who want a book that will both challenge and inform." "This important new book by one of primary care's most accomplished authors sets out clearly the academic basis for further developments in primary health care. Health systems will only function effectively if they recognise the importance of high quality primary care so I strongly recommend this book to students, teachers, researchers, practitioners and policy makers."